Set at the dawn of time, when prehistoric creatures and woolly mammoths roamed the earth, plucky caveman Dug (Eddie Redmayne), along with sidekick Hognob, unites his tribe against the mighty Bronze Age in a battle to beat them at their own game. 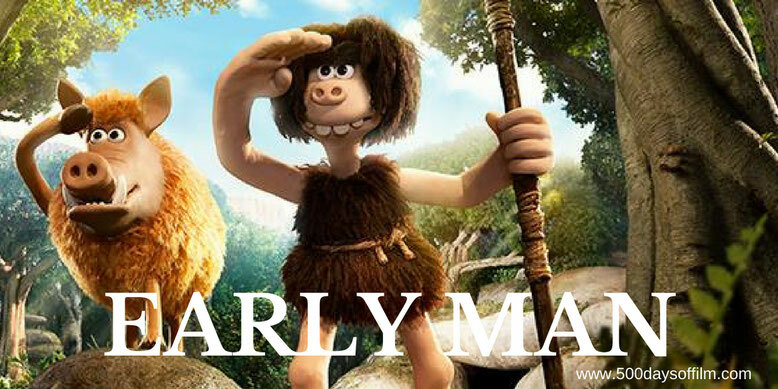 Early Man is another sweet and amusing animation from Aardman Studios. Less about the origins of the beautiful game, this is a story about the importance of working together as a team and always trying your best - even when the odds are stacked against you. Nick Park’s first outing as a solo director is an endearing and likable adventure. However, as charming as Dug's journey undoubtedly is, Early Man does not quite reach the genius level of Aardman’s previous films - particularly the Wallace & Gromit classics. Nonetheless, any Aardman film is a treasure - a joy to behold. The work (and patience) that goes into every stop-motion sequence just defies belief. From its very earliest moments, Early Man’s animation is impressive and inventive. In addition, as with all Aardman films, Early Man’s voice cast is superb - featuring great vocal performances from Redmayne, Hiddleston and Williams as well as welcome turns from Timothy Spall, Miriam Margolyes and Mark Williams. While Early Man may not rank among Aardman’s best, it remains a light and enjoyable romp for all the family. Have you seen Early Man? If you have, what did you think of this film from Nick Park? Let me know in the comments section below or via Twitter. You can find me @500DaysOfFilm.